Good afternoon everyone, and good afternoon in particular to those in our Sister Islands who could not be here today. One year ago - we all remember where we were; who we were with; what we were feeling; what we were doing. This time then, we were just emerging from our battered or sadly for many, destroyed, houses—from our bathrooms, closets, or anywhere we could find shelter. Within a few hours Irma had shaken us to the core; destroying much of our islands. As I emerged myself from our bathroom closet with my family, I can remember vividly the nakedness of the land. It seemed like every tree and leaf had gone. It seemed like every building was destroyed; every road blocked. We saw our homes, businesses, and public buildings partially or completely destroyed. For some of us, it was a house, vehicles and boats, crops, businesses and livestock. For others, it was our sentimental memorabilia and collectables—all gone with the wind. And, for some families, sadly it was serious injuries or the loss of a loved one. We still pray for their loss today. But despite these experiences, in what seemed to be the longest nine hours, when it was all over we had two things in common—we were thankful to see each other and we were thanking God to be alive. The days, weeks and months after the storm were tough and in many ways continue to be so. I know that we still feel and live the experience of the storms. We will all have memories of the storms and floods, and of the last year. We also have memories of loss, of separation, of shock, of grieving, even of fear. Those memories may fade. But, for me as I look back over the last year there are four memories I know won’t fade. A first is a memory of resilience. How despite what was thrown at us, we stayed strong. I remember being out across the Territory in communities and amazed at how resilient people were. How people didn’t get knocked down, but got together. When our Sister Islands— Virgin Gorda, Anegada and Jost Van Dyke—and communities were cut off, communities came together and supported each other to stay strong. The second is a memory of unity. What struck me, as then still a newcomer to these islands, how despite all the force of the storm – it did not tear us apart, it brought us together and brought together the beautiful and resilient people of these islands. For most people, religion and race did not matter. Personal preferences, status, wealth, gender, and creed were not a factor. Nobody stopped to ask if you were a Belonger or Non-Belonger, Black or White, religious or not before offering support. We believed then that unity was a key ingredient in the recipe of restoration. And, I know that this value, this belief still holds true today as we give thanks and reflect at this time. The third is a memory of kindness. What mattered perhaps most—was our many acts of kindness to each other as we worked to put the pieces of our lives back together in a unified way. One year ago, we opened our houses to each other even to those we didn’t know. We shared what little we had. We were a shoulder for each other, picking up the pieces together. History tells us that this is the character that the Virgin Islands was built on, and it is what will help us on our journey to restoration and sustainability. I thank everyone in this Territory for being each other’s heroes and heroines in such a difficult time. I encourage not just holding on to this memory of kindness, but continuing to live it as many people are still not where they want to be. Our kindness was supported by kindness from others. We continue to be grateful and welcome the unwavering support of local, regional and international volunteers and donors, who are doing their part to invest in making BVI the best destination and jurisdiction, once again. I thank all who have and are supporting us. And I thank the United Kingdom Government for stepping in quickly to support us with immediate military, security and humanitarian support. With continued assistance in our recovery efforts – helping to get the lights back on, key services running, boosting our security; and supporting us for the long term recovery. The fourth memory is of incredible service and dedication. I remember public officers, volunteers, persons in the community all coming together despite their own personal challenges to get this Territory standing firm on its feet again. I thank you all, and to the Red Cross, to Rotary, to Virgin Gorda Recovery Organising Committee and many, many voluntary groups who did and are doing so much. I also want to thank public officers. As they dealt with their own lives, they also had to deal with rebuilding the Territory. And I have seen incredible service and dedication. Nurses, doctors, police, prison, fire officers, Department of Disaster Management, public works, BVI Electricity Corporation, teachers, social workers and many, many others who worked endless shifts, slept on office floors, left their ruined homes to help people immediately after the storms and to help get us back on our feet. I know there are challenges. I recognise that many public officers are still working in temporary buildings or those that have still not been fully repaired and are suffering difficult working conditions as they did your jobs, and it is a priority that these are addressed. The fact that despite these challenges and what they had to personally sacrifice they were able to restore key infrastructure and public services and continue to serve the public in all the ways you do is admirable. Thank you to all public officers for your service. This memory of incredible service and dedication is one I want us to hold dear as we transform the public service. We have come a long way since last year. From those dark and desperate early days we got the lights back on, roads open, services open, businesses open. I have been honoured to work with Premier and the Government to support this Territory. We have improved security with investments both from the Government of the Virgin Islands and the UK to boost our police force, prisons and security agencies. We are restoring our disaster preparedness and response capabilities. I am delighted that visitors are coming; cruise ships are arriving. Families are returning home. Businesses are still opening, with new ones emerging. Our financial services industry remains a world leader. I look forward to seeing our children back in school buildings. Shelters fully repaired. Homes repaired and people living comfortably, enjoying a better quality of life. As we recognise and celebrate how far we have come, today is also a day to rejuvenate ourselves to continue our recovery. There is still a lot to do. We worked hard to come up with temporary solutions to get homes, businesses and services up and running again. These were vital and commendable and allowed us to function again. However, we need to guard against complacency. We must not allow temporary solutions to become permanent. We must not get used to this state. One year on, let’s look at things with fresh eyes and push ourselves to get everything to a condition that we can be truly proud of. Today is a time of remembering and reflecting. Of what we lost, of what we went through, of individual and shared memories, but it is also a moment to look forward. We have what we need in place to deliver our recovery. 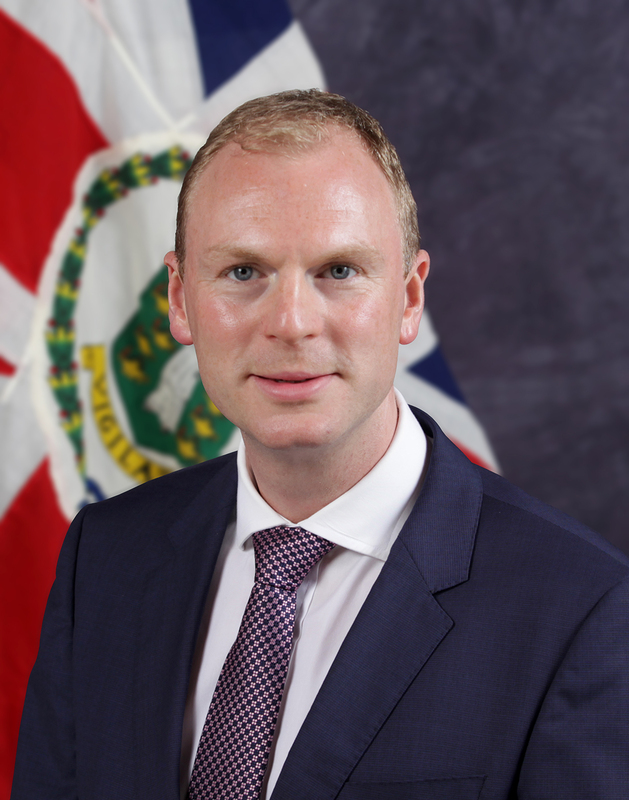 The Government has established the Recovery and Development Agency which is now in place carrying out the mandate of Government Ministries to BUILD BVI STRONGER, SMARTER, GREENER, BETTER; support for finance from the United Kingdom is there; the plans are there. We need to keep as focused on recovery as we were this time last year. And this is not Government alone – every individual and every community can help to take action to restore our Territory, to clear up, to support each other. Whilst it has not been an easy year, it has been an honour to be your Governor during this last unprecedented year – and an honour to be able to reflect with you this afternoon. Finally, as I prepare to take my seat, we should remember that we are in a hurricane season. Let us not take planning and preparation for granted. Let us remain alert. Clear the debris from your neighbourhood. Let us lend a hand to our neighbours. Let us get ready and stay ready. And most of all, let us remember the greatest strengths that God has given us and we showed last year. Let us hold on to and keep showing these vital gifts: our resilience, our dedication, our unity and above all our kindness to one another. Thank you and may God continue to bless all in this fantastic Territory.